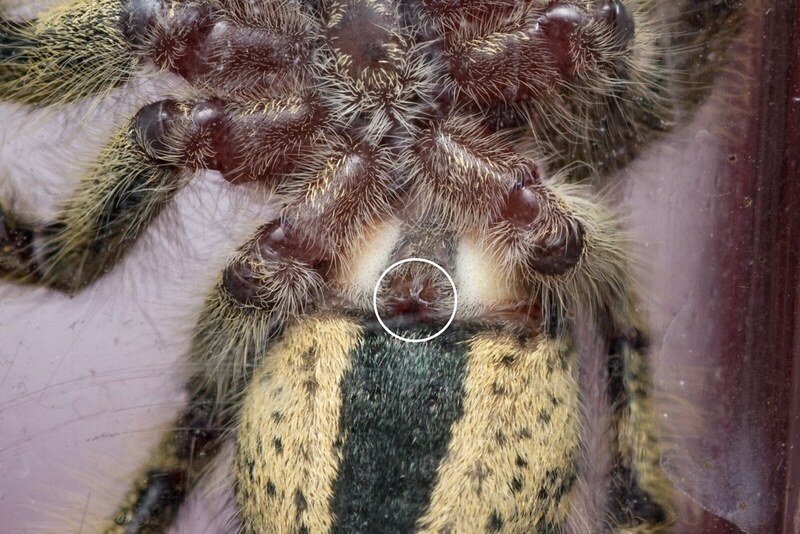 Epigynum as a tool for the determination of gender and maturity in Salticidae. The epigynum is the female copulatory organ of entelegyne Araneomorphae. Its function is to receive the male sperm provided by the embolus. This feature of female Entelegynae is a safe way to determine their maturity, especially helpful in breeding. Only mature females have a fully developed and sclerotized epigynum. The degree of sclerotisation is visible by the color of the cuticule. A sclerotized epigynum is black and reflective. The epigynum is located on the ventral side of the opisthosoma in front of the epigastral furrow and between the booklungs.